The marching competition in Market Street. 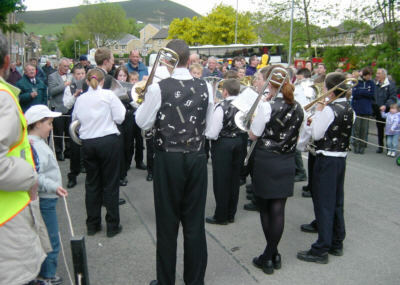 Every year on Whit Friday (the Friday after Whit Sunday), following the Whit Walks, the well-known Whit Friday Band Contests take place in Mossley as well as the surrounding towns and the villages of Saddleworth. Bands from all over the country, and some from abroad, tour the area in coaches, visiting as many contests as they can, hoping to win one of the cash prizes awarded for various categories. There are two contests in Mossley each year. 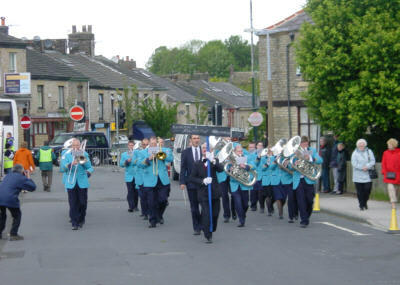 In Top Mossley, a marching competition takes place in Market Street. 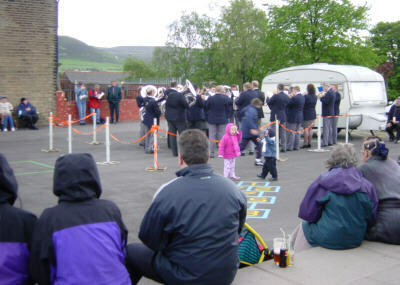 Bands then play their set piece in the playground of St Josephs school. 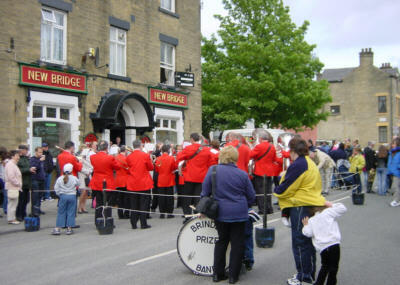 In Micklehurst, the marching competition takes place in Micklehurst Road, with the piece performed outside the New Bridge Inn. Main contest at St Josephs. The adjudicator sits in a caravan and does not know which band is playing. 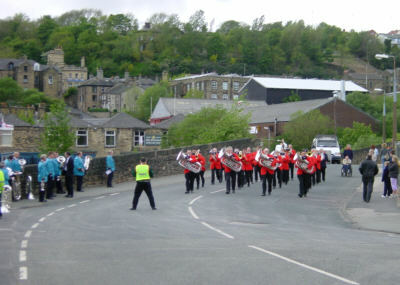 The marching competition on Micklehurst Road, approaching the New Bridge Inn. One of the many excellent youth bands that perform in these contests.